Speedy Reminder lets you very quickly add a reminder from anywhere without having to launch the Reminders app. Create reminders with title, note, priority, alarm, due date, and recurring reminders. Instantly! 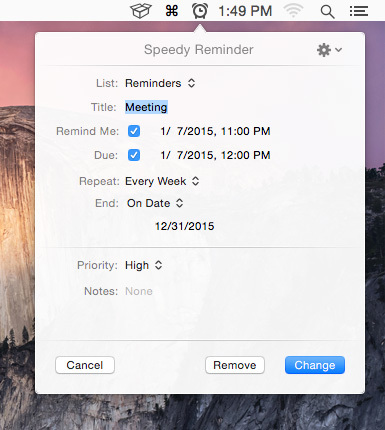 Speedy Reminder is fast and system-wide accessible from the menu bar and with a customizable keyboard shortcut. Reminders are synced via iCloud to your iOS devices or Macs. Easily edit recently created reminders. Speedy Reminder remembers up to 10 recently created reminders per list. Instead of opening Reminders, or keeping it open and switching to it from your current app, Speedy Reminder does it all with a click so you keep your focus on the foremost app on your Mac's screen. Speedy Reminder is exactly the kind of utility app which makes using the Mac's Menubar so great.